See how Mutt's text-based display outperforms the rest. Upgrade from BIND to djbdns. Check out Xara Extreme, a Linux-compatible alternative to Inkscape. Gentoo, power and flexibility, but not for the faint of heart. The fascinating story of how Firefox went from underdog to top-dog browser. How does Linux sound these days? 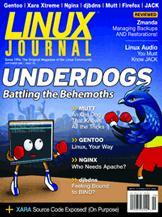 Dave Phillips gets his groove on in Part I of his survey of Linux audio capabilities. Doc Searls' EOF What Happens after Next February?